It is selling to App Store now. Please buy it from a link here. The software of iTunes is needed to buy the application program in the App Store. The person who is not possession must download here by this site. 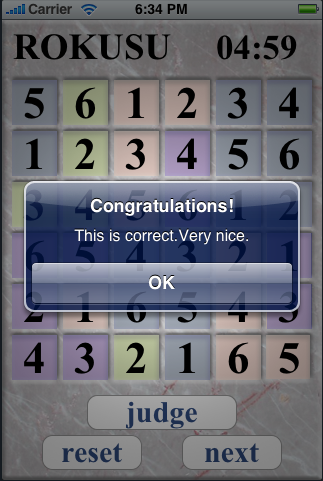 This game is reducing of the famous puzzle "Sudoku" to the size of 6×6 now among some the people. 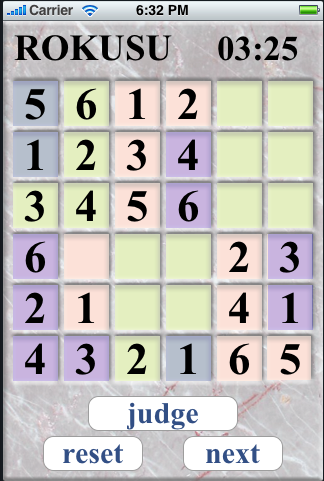 There is a merit that it is possible to play readily to the extent that it will be possible to do in a short time though the version of original 9×9 becomes easy a little. 1. The integer from 1 to 6 is put from among 6×6 spaces. 2. However, the same figure as the row of each length is prevented from entering. 3. Similarly, the same figure as as much as one row in side is prevented from entering. 4. 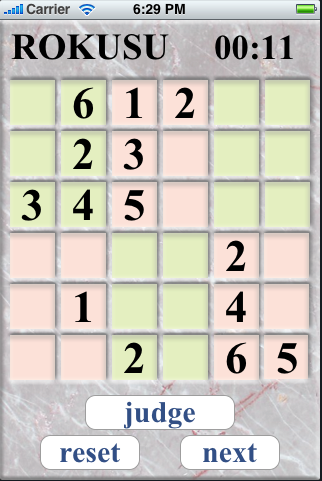 In addition, the same figure as the each area which is 2×3 is prevented from entering. The screen like the left comes out when the application " ROKUSU" is started up. The problem is set at random by 900 questions. The function of three buttons under the screen is as follows. 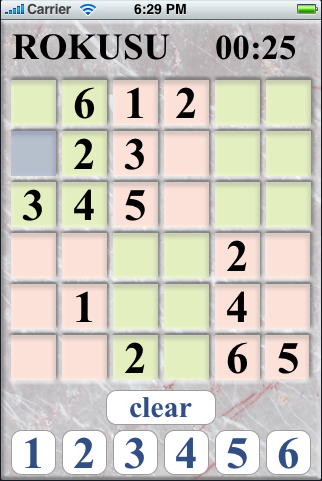 1.Judge button is the one which judges whether it is a correct answer of the completed puzzle. 2. Reset button is the one which delete all input figures. 3. Next button is the one which set the following problem. This button compulsorily ends the game on the way. The judge button was pushed with the figure had been input to all the spaces. 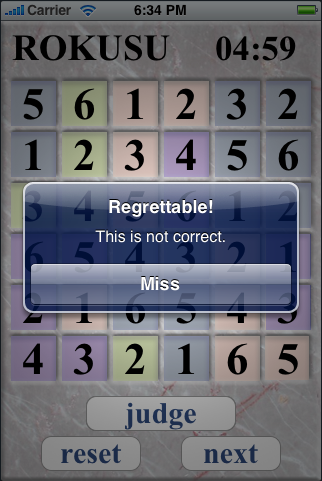 If it is a correct answer, the message like a left chart is displayed. An upper right timer stops when this display appears, and the time required is understood. The game was advanced on the way. The colors of the spaces of the input figure change. It discolors, the arrangement of the button under the screen changes as shown in a left chart if the space that want to input the figure is tapped, and it comes to be able to input the figure. Then, the button of the figure to be input is pushed. The clear button is a button that deletes one input figure. If the clear button is pushed at that time, it is possible to delete input figure when the figure button and the clear button are displayed under the screen. Copyright (C) 2009 Yoshiyuki. All rights reserved. I develop the application program in iPhone devices. 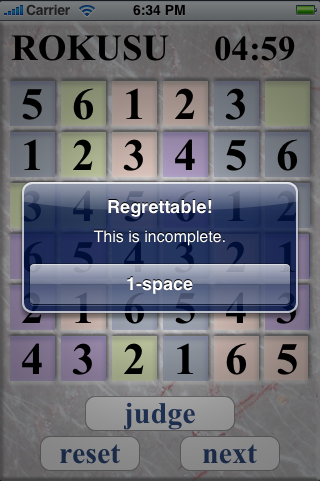 It is a message when mistaking this puzzle. It is a message when all the spaces have not been buried. The number of space that has become empty is displayed. One upper right space have become empty in case of a left chart.